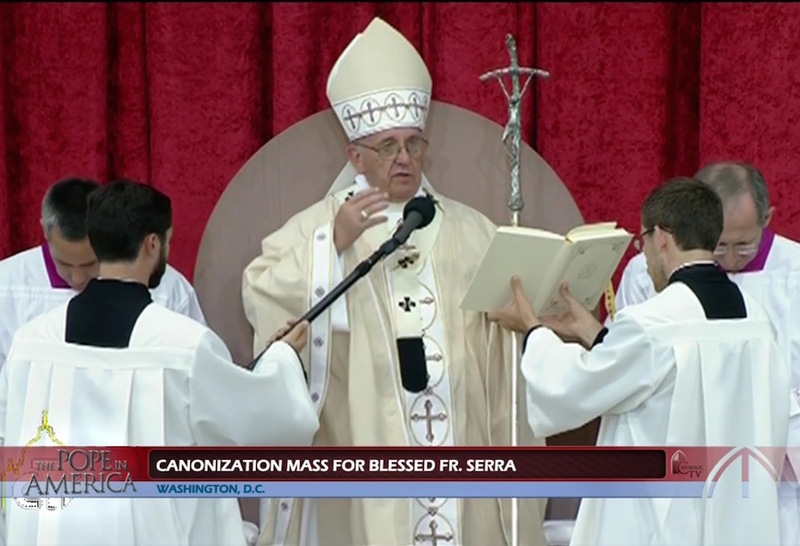 Pope Francis’ homily at the Canonization Mass of St. Junípero Serra in Washington. Jesus sends his disciples out to all nations. To every people. [To all.] We too were part of all those people of two thousand years ago. Jesus did not provide a short list of who is, or is not, worthy of receiving his message, his presence. Instead, he always embraced life as he saw it. In faces of pain, hunger, sickness and sin. 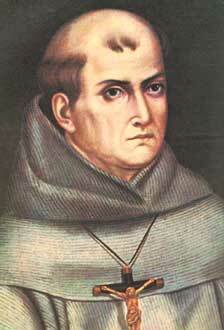 In faces of wounds, of thirst, of weariness, doubt and pity. Far from expecting a pretty life, smartly-dressed and neatly groomed, he embraced life as he found it. It made no difference whether it was dirty, unkempt, broken. Jesus said: Go out and tell the good news to everyone. Go out and in my name embrace life as it is, and not as you think it should be. Go out to the highways and byways, go out to tell the good news fearlessly, without prejudice, without superiority, without condescension, to all those who have lost the joy of living. Go out to proclaim the merciful embrace of the Father. Go out to those who are burdened by pain and failure, who feel that their lives are empty, and proclaim the folly of a loving Father who wants to anoint them with the oil of hope, the oil of salvation. Go out to proclaim the good news that error, deceitful illusions and falsehoods do not have the last word in a person’s life. Go out with the ointment which soothes wounds and heals hearts. The reason we are here today [that we can be here today,]is that many other people wanted to respond to that call. They believed that “life grows by being given away, and it weakens in isolation and comfort” (Aparecida Document, 360). We are heirs to the bold missionary spirit of so many men and women who preferred not to be “shut up within structures which give us a false sense of security… within habits which make us feel safe, while at our door people are starving” (Evangelii Gaudium, 49). We are indebted to a tradition, a chain of witnesses who have made it possible for the good news of the Gospel to be, in every generation, both “good” and “news”. Father Serra had a motto which inspired his life and work, a saying [that above all] he lived his life by: siempre adelante! Keep moving forward! For him, this was the way to continue experiencing the joy of the Gospel, to keep his heart from growing numb, from being anesthetized. He kept moving forward, because the Lord was waiting. He kept going, because his brothers and sisters were waiting. He kept going forward to the end of his life. Today, like him, may we be able to say: Forward! Let’s keep moving forward!